This metal military style dog tag comes on a ball chain. 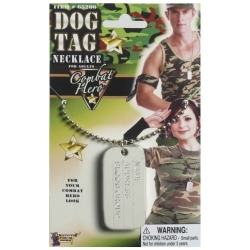 Dog tags are a required part of every military uniform and are a must to complete any of the military costumes that we sell. They are also very popular with our directors who are producing “South Pacific”, “Anything Goes”, or “Fanny”. The military dog is made of a silver tone metal and measures 2” wide by 1” tall.